Short on time but still want to sweat? These workouts will get you in and out in about a half hour or less. Row intervals of 1-2-3-3-2-1 mins. (total 6 rounds), with the same amount of rest on each round. Start each round with a few short strokes to get going and build to your rating. Each piece (interval) should be done at 80 percent of your max: You can talk but you’d rather not. Stroke rating 24-30 strokes per minute. Use how you feel to determine what stroke rating to hold, your goal is to maintain the same split within about 5 seconds on each round. If you find you can’t talk, you’re going too hard! Repeat until you have completed two 5-min rows and skis. This is a great workout to partner on, too. In that case one partner rows while the other skis, then you switch. NOTE: The shorter the workout, the longer the warmup. You should have a good sweat rolling before you begin this one. 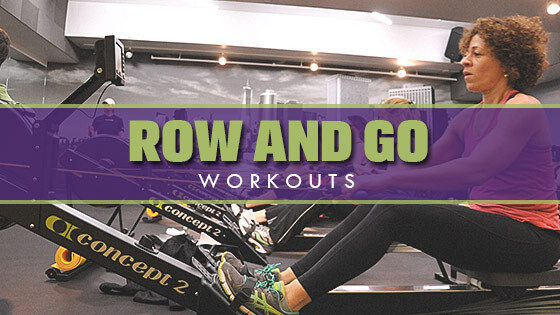 This BodyGO Row workout comes courtesy of Concept2 Approved Indoor Rowing Instructor Laurie Miller of CrossFit Wise: Training For Life in St. Louis. Once you’ve warmed up this workout takes only 18 minutes, and can even be cut back to 12 or 15 minutes. Record your meters in case monitor shuts down during exercises, or go back into your memory and retrieve them when you’re done. Warm up, then row 5 minutes at 75-85 percent intensity (you can talk but you’d rather not) followed by 5 pull-ups or 10 push-ups PLUS 10 jump squats or 10 lunges. Do at least 4 rounds. Note: Scale this workout to three rounds if needed to meet your schedule, or add rounds if you’d like a longer workout. Warm up, then set your rower monitor for Intervals>Variable>Time, with intervals of 1,2,3,4,3,2,1 minutes, with undefined rest. After each interval ski as many meters as you rowed, in however much time it takes you. Set your monitor for a minute of work and unlimited rest. This is especially good if you can mix in a SkiErg, but it can be done with the rower alone, too. Warm up with your choice of cardio, then set your monitor for Intervals>Time, with 4 mins of work and unlimited rest (or 2 mins of rest if your monitor doesn’t have the unlimited rest feature). If you are doing the 2-minute rest version, add reps to the floor work if needed to complete the two minutes.